Hardcoat anodized Idler rolls are included at the web entry and exit to stabilize the web under the electrode. 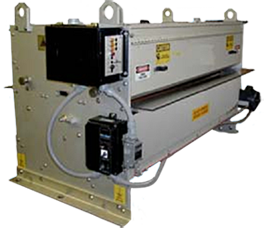 There are several other options available to improve the use or performance of the PowerHouse® Sheet Fed corona treater. In order to generate a uniform corona discharge on thick materials, a special corona generator design is required to eliminate pinholes and burns on the edge of the web. Our PowerSource II UHF corona generator includes a completely new high voltage transformer design that provides sufficient primary and secondary voltages without excessive heat rise in the windings. In addition to the voltage requirements, an output frequency range of 20-30 KHz is necessary for thick rigid materials.